Each attack gets +5 from my 20 strength and +5 from Magic Fang which I had cast permanent on both hands. That gives me the four attacks at +18’s and a +13! We encountered a Frost Giant, and I just charged at 100 feet to deal 53 damage! This half-orc NPC with a great-axe charged too and critically hit (with his x3 modifer) to deal only 54 damage! The rest of the party went, and the only other damage dealt was about 30ish from a lightning bolt…I got hit for like 40 damage for being the biggest threat. My turn came, I hit on THREE of the four attacks…(damn rolling a one)…and I doubled the damage count on him, bringing it up to about 280ish. He died. I danced. 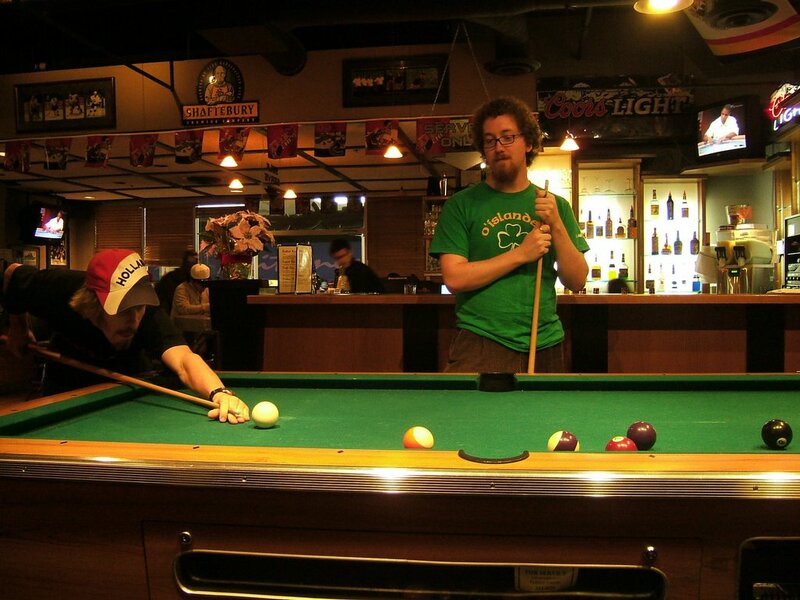 Here is Sean and I playing pool before we go bowling! I’m the one shooting with the Holland hat on! And that obviously means Sean is standing! Well It has been roughly 3 weeks since we got home. I am glad to be home but I keep thinking about our trip and how much I want to go back to Germany or Spain like next week. But of course I can’t so I have to make the best of it here. So…My Birthday is in 2 weeks! Yay ME! Today we had our annual Fall Fair at our parish! Last night we spent a few hours cleaning up after the usual parish Bingo, then we set-up all the games and decorations! At 8:30 in the morning, bright and early, we gathered to get ready for the fair! My youth group ran the games inside the gym, but this year was different! For my first time, I was no longer a member, but instead a counsellor! It was easier work, I thought, compared to the other years when I was working it. Supervising is much easier I found haha! Out in another building, another parish group was selling donated items on behalf of the parish! I donated a few items, and saw a few of them being taken away by happy customers! I managed to pick up a 27 inch TV for $25! I brought it home a bit later and it fits JUST BARELY downstairs where our old TV was. It looks really pro! The fair ran really smoothly, and we brought in a good chunk of money for our youth group! Later that evening, I drove out to our city hall and sat and watched the election results come in. I had been contracted by Shaw to report the results to them! As each of the 10 polls came in, I had to call my contact and read out the number of votes for each candidate. There wasn’t any change in my city, but there were some big changes in neighboring cities! So what fruit/vegetable do you think was discovered by man first?